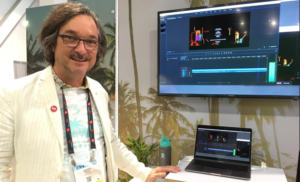 LAS VEGAS — GrayMeta used NAB to tout its latest Iris and Curio solutions, including Iris Cloud and a GrayMeta Curio extension for Adobe Creative Cloud. “Our main focus at the show was Iris Media Solutions, including our Iris server products and our new product, Iris Cloud,” Gregory Cox, VP of Technical Product Solutions at GrayMeta, told the Media & Entertainment Services Alliance (MESA) April 11, the last day of the show. Iris Cloud is the latest addition to the company’s Iris Media Solutions and initial feedback to it was strong, Cox said. As GrayMeta disclosed just ahead of the show, Iris Cloud was built to leverage all the benefits of the cloud and natively run in the cloud — making it accessible virtually anywhere in the world. It’s a frame accurate quality control (QC)/quality assurance (QA) solution that enables QC and QA teams in studios, broadcast networks and media services providers to use many of the same validation features of Iris — only now in the cloud. After all, as more content libraries and workflows transition to the cloud, QC and QA processes follow. Using Iris Cloud, QC/QA operators working with video content stored in the cloud, such as video-on-demand (VOD) or repurposed assets, can do quick spot-checks or validations using a browser-based, intuitive interface, according to GrayMeta. Operators can, therefore, be rest assured they have the correct content to make further edits or review before distribution without ever having to spend extra time or money to pull content out of cloud storage, the company said. Several broadcasters approached GrayMeta requesting help, he said, pointing to one major client who had more than “125,000 assets dating back to 1967 sitting in the cloud.” So, GrayMeta provided that customer with a “solution where they can actually pull that content back, see what it is and create the metadata for them automatically,” he said. From speaking with several clients, it appears that over-the-top (OTT) partners like Netflix, Amazon and Hulu are once again “pushing the envelope and kind of forcing broadcasters to do it,” he said. BeBop is “taking Iris and virtualizing it in their environment,” Cox said, explaining that’s enabling BeBop clients to, in turn, use Iris in their environments as well. GrayMeta “worked out a subscription model, whereby you can actually buy monthly licenses for Iris and use them in the BeBop platform, which is a powerful, secure platform that provides all the analytics that you might need,” he said. On the Curio front, the newly released GrayMeta Curio extension for Adobe Creative Cloud (CC) provides functionality enabling users to streamline content creation within additional CC applications including Illustrator, InDesign and Photoshop. The extension enables users to find content faster and more efficiently than ever, by leveraging deep insights created by artificial intelligence (AI) and machine learning (ML) – enabling them to quickly find the content they need, including specific people, objects, logos, brands, locations/landmarks and more, Adobe and GrayMeta said. GrayMeta’s overall Curio solution — connecting all cloud and on-premise storage locations via one interface, with built-in AI and ML — took center stage during its presentation on the MESA digital asset management (DAM) tour at NAB April 9. GrayMeta showed how crucial automated metadata collection can prove to be. GrayMeta Curio helps companies create, extract and store intelligent metadata, allowing for expanded searchability across applications. GrayMeta, with all of its various tools, is “absolutely looking to be the industry leader in our areas of expertise: Content harvesting, metadata creation, metadata tagging and continuing to build our own machine learning services,” Cox told MESA. 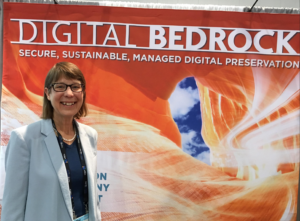 In its third year at NAB, Digital Bedrock saw increased interest in its services, according to Linda Tadic, the company’s CEO and founder. Unlike last year, visitors stopping by the company’s booth this time were usually making “targeted visits” and were “people who had us on their list,” she told MESA April 10. Although many Digital Bedrock customers are members of the media and entertainment sector, the company’s also seeing interest from an increased number of industries, she said, noting somebody from the government defense sector stopped by earlier that day. The appeal for that person was how Digital Bedrock deals with “unstructured metadata and how secure it is,” and also – “ironically” amid all the growing interest in cloud services – the fact that Digital Bedrock is “off-cloud,” she said. Participating in the tour was a big success for Digital Bedrock and “gave a lot of visibility” to the company, she said, pointing to the fact that one person who took the tour stopped by the booth the next morning and “sat down for like an hour” to talk. Sohonet’s “main focus” was clearly on its ClearView Flex platform at NAB 2019, where Dennis Rose, chief revenue officer at the company, told MESA that feedback about the service continued to be strong. “Even though we introduced ClearView Flex in 2016, last year we were still very much in education mode,” he said April 10 at the show, adding: “What’s happened this year is people are coming in and either they have it [and] they’re interested in new features or they have come across it in” their segments of the industry, including people who create movie trailers, and are interested in giving it a try. The new features include functionality that gives “more empowerment to users for configuring” what the identification burn-ins are for security, he said. 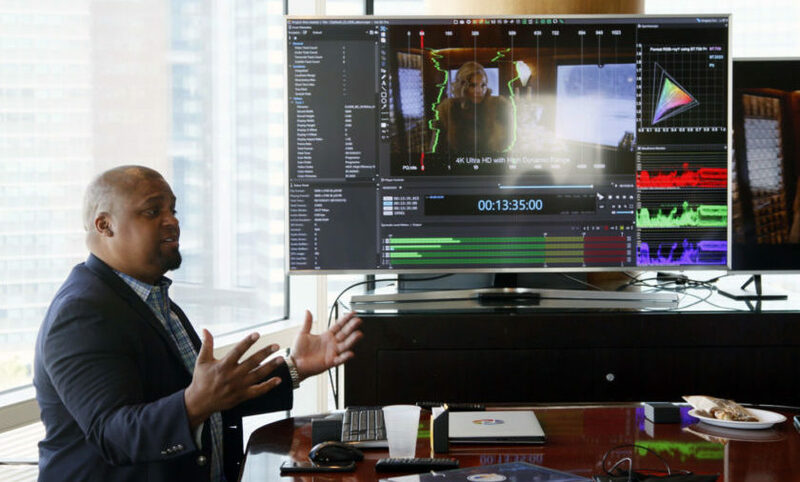 ClearView Flex “allows people who are in the film and TV industry – typically editors, producers, directors and colorists – to work remotely,” wherever they may be working on a project, he noted. Those key creative people and production executives can review and approve live, encrypted video streams from any source remotely from their computers or mobile devices, the company pointed out ahead of the show. Earlier in the show, during MESA’s digital asset management (DAM) Tour April 8, Drew Law, Sohonet customer success manager, spotlighted the real-time creative collaboration capability provided by ClearView Flex. He demonstrated during the DAM Tour how – whether you’re looking to review dailies, remote color grade or view live feeds direct from the camera — ClearView Flex provides you with the security and flexibility to collaborate with your teams remotely and in real-time, from anywhere in the world and on any device.